What’s Pace Got To Do With It? Pace, like most things in this universe, is relative. What is a fast pace for me, is a comfortable pace to my runner friends who can WIN marathons or an exhausting pace for some of my fellow mid-pack runner friends. Also, depending on where you are in training, a certain pace is untouchable without the proper training. So what does pace have to do with it? For finishing in a certain time… everything! Delusions of Grandeur… we “think” that we can run a race in a certain time and even put it down on our entry form. I know that I put down, by default, a PR time on the race form. After all, why not dream a fast dream. Seriously. As if, I have any clue what I am going to run weeks and weeks from now. I’ve even been there, on race day, before the gun goes off thinking that I could run the race in a certain time, but the reality was going to be much, much different. So for my upcoming Publix Georgia Marathon (thanks to 26.2 Quest!) on March 18th, I’m pretty sure I put down 4 hours and 4 minutes to finish the marathon. A PR time of 3 minutes and change at a pace of 9:18 min/mile. I’ve included some pace calculators here… most just give you what the average pace for a certain distance and time. My fave, is the McMillian calculator… this one gives you paces for various distances which is very handy for training. One great myth of distance runners is that we run the same pace, usually perceived to be something fast, every time we go out and run. Hardly, because there are different “types” of workouts with different “paces”. 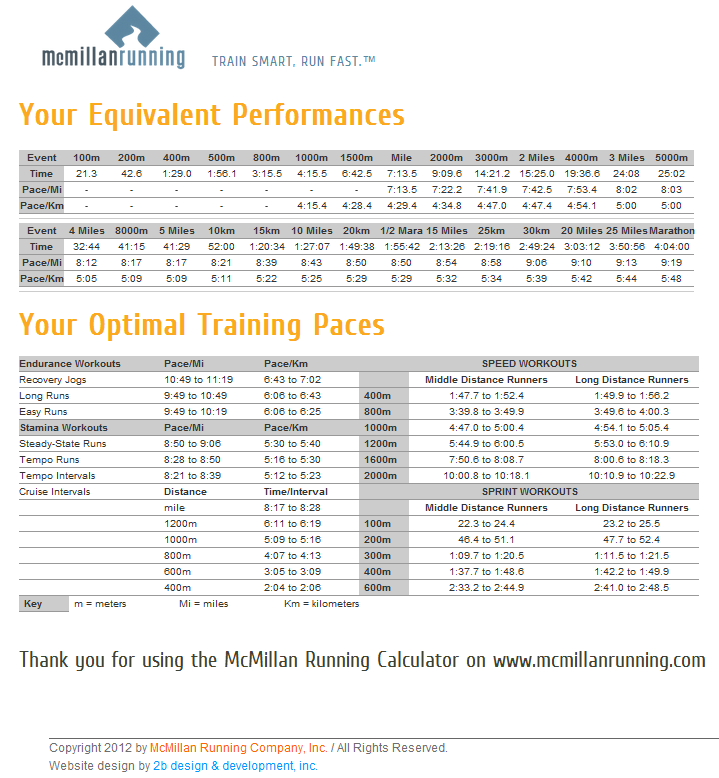 The McMillian calculator makes the math easy for you and lays out the pace range for certain types of workouts. By using these different pace ranges for the different workouts, you are unifying your training for the ultimate goal… the marathon finishing time. However, there are some obstacles. Unless you are some ‘Robin Hood’ type runner, you aren’t going to be able to hit the pace accurately each and every time. Hills, turns, fatigue, traffic and the occasional lost person asking for directions are things that we encounter while we run that keeps us from hitting our pace each and every mile. Another thing that I have noticed about trying to train and keeping a certain pace is that the fastest and slowest paces are the hardest to keep in check. The fast pace is obvious why it is hard to keep. We get tired. Running fast is hard. The slower pace, however, is more difficult to understand because why would it be harder to run slower. Slower doesn’t equate one-to-one with Easier. Take my 9:18 pace for example. My most recent 5k race (1.1.12) was at a 7:50 pace. This is actually 13 seconds FASTER per mile then the recommended 8:03 pace (but I am not worried) for that distance. For my long distance runs, however, my pace should be between 9:49 and 10:49 which is pretty comfortable, but I can tell you that if I run ALONE, I will tend to have a pace that is around 8:50 or 9:00. Whenever I can, I try to run with people who run at a slower pace, so that I can discipline myself to run that slower pace. I benefit from the camaraderie and the disciplined pace. Running isn’t all about trying to run as fast as you can, each and every run. It’s a symphony of organized runs which harmonize together for a grand finale on Race Day. This entry was posted in running and tagged georgia marathon, marathon training, pace. Bookmark the permalink. 2 Responses to What’s Pace Got To Do With It? Well that’s timely. I have never run anywhere if I could possibly avoid it. However, since I walk the dog every day I thought it would be quicker if I could run. So I am, although since I’ve only just started I’m very slow and going very gently. Because I know nothing about it, I opted for the runtastic programme which is an app on my iphone, strapped to my arm. I like it because of the GPS tracking, although I expect yours are a lot more advanced. Maddy – Awesome! Slowly is a very, very good place to start. And that you have an app to keep track of your progress is also very motivating and also enlightening. We often forget from where we started. Personally, after weeks and weeks of training, I forget how difficult it can be travel 2 miles, so have a record reminds me! I don’t use a GPS device. I do try to map my routes before or after I run (as best as I remember) to get a gauge of what my total distance will-be/was for the run. I try to use as few gadgets as possible, not that they don’t have their merit, but I have the potential to obsess over them and want to keep things simple.